No question about it! Improving your home's air quality is as easy as using FiltreteTM Air Filters. What's the difference between fiberglass filters and Filtrete filters? What's the difference between washable filters that can be reused and Filtrete filters? Will my Filtrete filter eliminate the need for dusting? Is it necessary to have my ductwork cleaned even if I use Filtrete filters? If yes, what method is best? 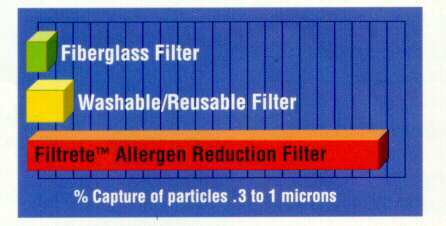 Do Filtrete filters have antimicrobial agents that I've seen advertised in other filters? Will Filtrete filters reduce mold and mildew in my home? Is it necessary to change the way I use my Filtrete filter in the winter? Is it true that my furnace and air conditioner filter can restrict air flow? What happens if I leave my filter in too long? Fiberglass filters were originally developed to protect your furnace and/or air conditioning system's blower motor and equipment. They were not intended to improve your indoor air quality. Filtrete filters can do both! Filtrete filters help improve your indoor air by attracting and capturing allergy-aggravating micro particles, as well as helping keep your furnace equipment clean. As the air in your home is continually recirculated through the filter, it gets cleaner and cleaner. Surprisingly, as the chart below shows, expensive washable filters are more similar to fiberglass filters in their ability to capture micro particles. These are typically designed to be washed out monthly and reused. Test show that this type of filter is not very effective at capturing the smaller, respirable particles from the air. Respirable particles are those that are inhaled into the lungs and can cause respiratory problems. Although some brands claim to have an electrostatic charge created by air movement through the media, the charge is minimal and plays little or no role in particle capture. A Filtrete filter will reduce dusting but it won't eliminate it. Atmospheric dust usually contains soot and smoke, silica clay, decayed animal and vegetable matter and materials in the form of lint and plant fibers. It may also contain living organism such as mold spores, bacteria and plant pollen. These particulates can range in size from .001 microns to a relatively large 100 microns. Because of the density of the large particles, they will settle out on your furniture long before they reach your filter. Under normal conditions we recommend replacing your old, worn-out filter at three-month intervals. You may wish to replace it more frequently depending on environmental conditions in your area, activity in your home or any needs of specific family members. While it's not always necessary to clean your ductwork when installing a Filtrete filter, you should have a professional duct cleaner provide an inspection if it has been awhile since your ducts have been cleaned, or they have never been cleaned to your knowledge. Avoid offers for "one hour cleanings"; proper duct cleaning generally takes up to four hours. Check your Yellow Pages for duct cleaners or ask a reputable HVAC dealer for references. In addition to using powerful vacuums, make sure they will scrub the inside of the ducts with brushes to help loosen any debris. Filtrete filters will not support the growth of bacteria, mold, mildew or fungi with normal use in the forced air heating and cooling system environment. Most bacteria, fungi, mold and mildew require high humidity or a wet environment to grow and multiply. Heating and cooling systems are low humidity, dry environments that will not support them. As a result, there's no conclusive evidence to show that antimicrobial additives provide an advantage. Your Filtrete filter will capture airborne mold and mildew, but it won't reduce the mold and mildew that is already growing in your home. The best way to eliminate these irritants is to locate the source of growth and kill it. Generally, mold and mildew thrive in dark, moist areas. No. Air filters should be replaced at least as often as manufactures recommend regardless of the time of year. 3M recommends changing Filtrete filters every 3 months. A dirty filter can restrict airflow to the point where severe damage can occur to the heating and the cooling system. Of course, unusually dirty duct work, construction work, furniture or drywall sanding, the number of pets and the presences of smokers are some of the things that can shorten the life of your filter prematurely. In these cases, it's necessary to change the filter more frequently. Yes. When any filter collects particles, air is forced to travel around the trapped particles in order to pass through the filter. When a filter's appearance changes, it simply indicates that the filter is doing its job. Of course, some filters work better than others. The Filtrete Micro Particle and Airborne Allergen Reduction Filter outperforms all other 3 month, 1" filters at capturing airborne allergens including pet dander, mold and bacteria, even microparticles like smoke and dust. Just make sure you change your Filtrete filter regularly to optimize its performance. High efficiency filters need to be changed frequently. If they are not changed as recommended, the filter can become clogged and the airflow through it will be reduced, reducing the air coming out of the register. If a clogged filter is in a furnace, the furnace may cycle on and off. Because of the reduced airflow through the heat exchanger, less heat is transferred out of the plenum. As a result, the fan/limit switch senses that the temperature is too high and turns off the furnace even though the room is calling for heat. The plenum cools quickly and the cycle starts over again. Based on field-testing, your Filtrete filter should be changed every three months under normal conditions.